Zion Market Research has published a new report titled “Surgical Robots Market by Component (Surgical System, Accessories, and Service) by Application (Gynecological, Cardiovascular, Neurosurgery, Laparoscopy, Urology and Others) and by End-users (Hospitals and Ambulatory Surgical Centers): Global Industry Perspective, Comprehensive Analysis, and Forecast, 2018 - 2024”. 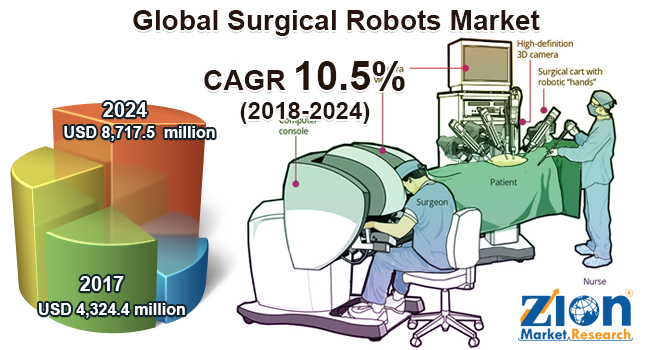 According to the report, the global surgical robots market was valued at approximately USD 4,324.4 million in 2017 and is expected to generate revenue of around USD 8,717.5 million by 2024, growing at a CAGR of around 10.5% between 2018 and 2024. North America, Europe, Asia Pacific, Latin America, and the Middle East and Africa are the major regional segments of the global surgical robots market. North America is anticipated to remain the leading region over the forecast time period, owing to high adoption and acceptance of surgical robotic procedures and well-established healthcare infrastructure in the region. Developing healthcare systems and supportive government policies for healthcare automation and surgical robotic procedures are likely to fuel this market’s growth in the Asia Pacific region. Developing nations, such as China and India, are the most prominent markets owing to the growth potential for the market players.